Carpet manufacturers recommend “hot water extraction” cleaning. No carpet lasts forever, but you can add years to its life by maintaining it properly. A carpet wears out because of foot traffic and dirt particles that get trampled deep into the pile. When these particles aren’t vacuumed away, they have an abrasive effect on the fibers that dull the carpet’s appearance. Use the following tips to maximize the life of your new carpet and help it retain its original beauty and quality for years and years. Vacuum frequently. For best results, use a vacuum cleaner with beater bars and good suction. Set the beater bar height to a level where the bristles are just hitting the top of the carpet fibers. If set too low it can damage the carpet and wear it out faster. Change bags and filters routinely. Clean spills promptly. Scoop as much of the spill up as possible, then blot with a color-fast absorbent cloth to remove excess moisture. Apply warm water to the stained area, then blot. Press firmly to remove as much moisture as possible. Do not rub. Repeat until no stain is evident on cloth or towels. Have periodic professional carpet cleaning. 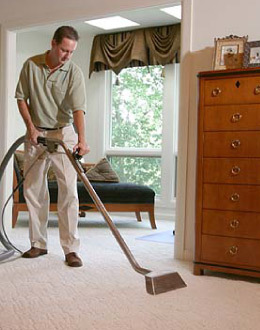 When vacuuming no longer removes all of the soil, or stains remain, it’s time to call a professional carpet cleaner. We recommend professional cleaning at least every 12 to 18 months, depending on traffic and carpet color. Lighter carpet shades or high traffic areas may require more frequent professional cleaning.